And preserving possibilities for change, by Yan Linhart. This is an excerpt of an article from Boom Fall 2015, Vol 5, No 3. Tomatoes can be sunny and delightful sources of gustatory joy. Unfortunately, they can also be utterly detestable wads of wet cardboard. The difference is that the tasty ones were bred to be tasty. The tasteless ones were selected for so-called “shippability,” which means that they are tough. They are so tough that in my genetics course we play catch with them across a large lecture hall. The tomatoes survive multiple throws from students keen to show off their good arms and maybe score a splat on their instructor’s shirt. I am pleased to report that no such splat has occurred in ten years of testing. This interactive class experiment is always popular, and it’s a testament to the power of evolution by selective breeding. The tomatoes work well for this experiment because being projectiles is in their DNA. They are the descendants of tomatoes that survived lobbing by their originator, Jack Hanna of the University of California, Davis. Hanna wandered through tomato fields, picked some fruits, and chucked them onto nearby paths. Those that didn’t splatter but survived unbruised, he kept—and bred. Thanks to such stern evolutionary tests, our grocery stores were soon blessed with tomatoes that can withstand machine harvesting, tight packing, and strong-armed students, but utterly lack flavor. Indeed, those commercial tomatoes are better suited for summer sports than for dinner plates. In contrast, the tasty tomatoes I grow in my garden will spontaneously split open from an overabundance of flavor if I leave them on the vine too long. The tomatoes are just one example among millions of species being manipulated by evolutionary events, right before our eyes. To many people, “evolution” means a slow and majestic process that unfolds over millions of years: we see fossils as witnesses of past lives, and we imagine the rise and fall of dinosaurs, mastodons, Neanderthals. These are certainly elements of the sagas that evolution tells. But they’re not the only story. Biological evolution is happening all around us, all the time. It’s caused by shifting environmental conditions that provoke changes in genetic features. Evolution is straightforward and easy to observe, in the present moment—and those tough tomatoes offer a fun, if tasteless, window onto it. California is an especially good place to witness evolution. The state’s insular features give it island-like characteristics, and islands are known to be special settings to witness evolution in action. California is isolated from other landmasses by the ocean on its western side, and distinctive landscape features limit many species’ movement in other directions as well. High mountains and deserts are barriers preventing easy movement to the east. Deserts also reduce movement to the south. To the north, passage into and out of California is limited by mountains and colder climates. 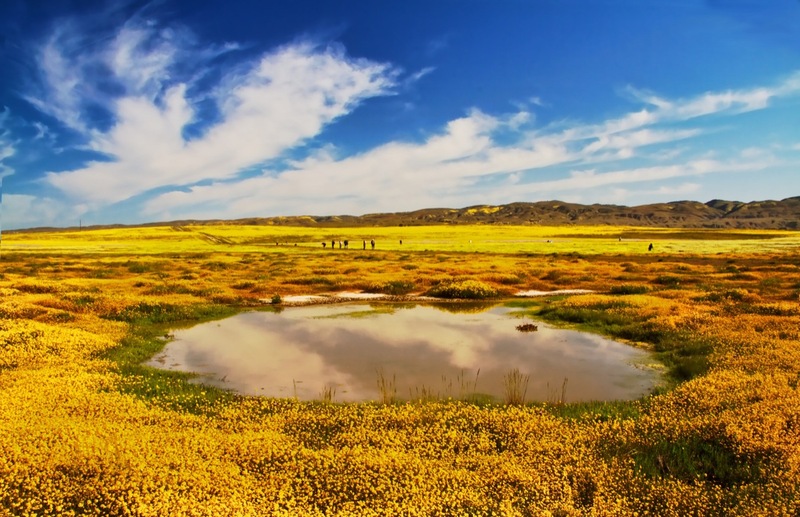 A vernal pool on the Carrizo Plain. Photograph by Flickr user Mikaku. Within California, we also have multiple kinds of archipelagoes. These aren’t the kind that poke up out of oceans, but rather chains of “habitat islands” that can occur in all sorts of environments. Within California, animals and plants confront landscapes that range in elevation from over 13,800 feet to below sea level, and within these landscapes are archipelagoes of habitat islands defined by shifting geology and soils that govern who can live where and how. Take salamanders. Salamanders are moisture-loving Californians, and one group of these secretive amphibians has provided UC Berkeley’s David Wake and his collaborators an opportunity to study the origin of new species. These salamanders, of the genus Ensatina, live in habitats that are cool and permanently moist. Their ancestors came from regions to the north. As they moved south, they encountered the Central Valley, where hot and dry ecological conditions were not to their liking. So some populations moved south along the Coast Ranges, while others migrated south along the Sierra Nevada. Over time, as the salamanders faced the different sets of conditions prevalent in those areas, their DNA began to change. Eventually, when, after many millennia, individuals of Sierra salamanders met members of the Coast Range gangs in Southern California, the two groups had become so different that they rarely interbred. They had become different species.